This article tells the story of a true island legend: Rick Kips. Upon meeting him, the extent of his storytelling charm quickly becomes evident. In fact, it is no surprise that his published autobiography, IBIZA en andere avonturen (IBIZA and other adventures), has become a bestseller. As the book is presently only available in Dutch, we felt compelled to share just a little of Rick’s extraordinary life with you here. Rick comes from a major Dutch meat packaging company: Kips. The story of his arrival on the island in 1957, aged six, paints a vivid picture of Ibicencan life in the fifties. At the time he, his parents, and older brother, had ventured off on holiday to Majorca. Having successfully made it to Palma, they were promptly informed that their travel agency had gone bust, leaving them no prospect of returning home any time soon. As such, the offer of carriage on a WW2 Bristol Blenheim Bomber to the next island, Ibiza, was somehow one that they couldn’t resist. The family landed on a tiny airstrip in the sand. It is hard to imagine that this unassuming patch of land was later to become the island’s main airport, frequented by over four million people a year. As main roads were also not yet in existence, their onward journey to Ibiza town took a gruelling three hours. Rick recalls pitching up at the sandy Vara de Rey, where donkeys used for transporting ice were lined up outside a hotel. He remembers contemplating how on earth, in the heat of the summer, any ice ever arrived intact? The hotel in question was the Montesol which, at the time, was focused less on hospitality, and more on its role as the sole ice maker on the island. A midnight embargo on the use of electricity meant that oil lamps and candles were the strict order of the night. After a short while, Rick’s “well to do” father could not abide by it any longer, and ventured out to find more comfortable accommodation for himself and his family. Very soon, he set his eyes and heart on a yacht moored in the port. Regrettably, the impressive vessel was already taken, and by none other than Errol Flynn; who later became a close family friend. Sitting on the steps of a building, looking despondent and desperate, the Kips family later caught the attention of a passer-by, Dr Alfredo Roig. Having no grasp of Spanish, they somehow managed to gesticulate their plight. Alfredo, who was the only medical doctor on Ibiza, and thus of huge political and social importance, took this as his cue to introduce them to the most influential people on the island. Not least, Juan Bermejo, the commander of the navy who, in Franco times, held the highest political rank on the island. It would probably be fair to say that this chance meeting set the tone of the rest of Rick’s life here. A large estate in Cala Carbó, built on land purchased by his father, became Rick’s base here for many years. For a long time, a director of the CIA was his neighbour, creating all manner of intrigue for Rick as he grew up. Aged 18, whilst studying dentistry in Malibu, he tragically lost his father to cancer. A family friend, Dr. Robert van Riet, stepped in as his guardian. Robert was one of the first plastic surgeons in California and, as such, extremely well-connected; intensifying Rick’s exposure to the celebrity world no end. The most notable association of which was probably with his neighbours in Palm Springs: Frank Sinatra and Barbara Marx. Rick remembers the fateful day when he and his brother ruefully turned up too late for a private flight to Pasadena with Sinatra’s mother, Dolly. They were to later learn that the Learjet had crashed, killing all inside. Needless to say, they are eternally grateful for this very lucky escape. Rick’s other celebrity friends are too numerous to mention here, but suffice to say the Pope, Liza Minnelli and Bob Hope, amongst so many others, featured heavily in his life. Outside of America, Rick has lived in countless European capitals over the years. Argentina also featured strongly in his life as the place where he reared polo horses, and set up the biggest winery in the world with his business partner of many years: Lord Alain Levenfiche. 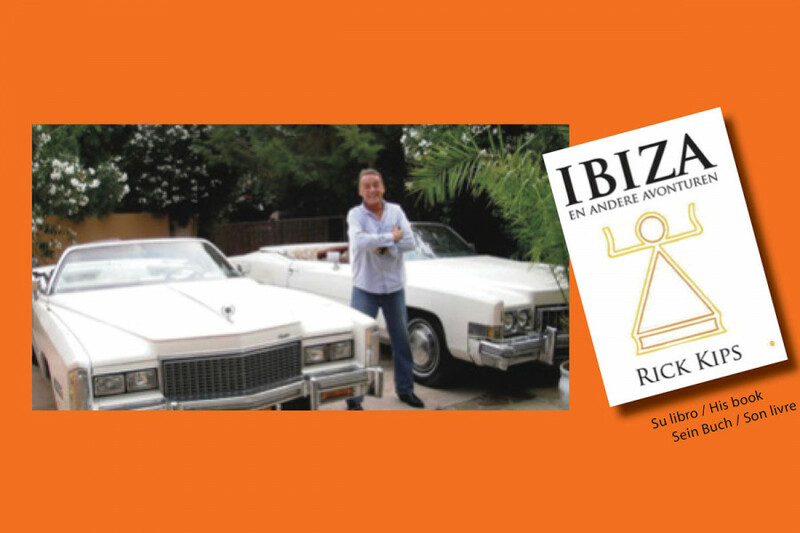 It is hard to say whether, in Ibiza alone, Rick is best known as a bar/restaurant/real estate expert, past manager of Pikes and the Hippodrome, owner of a Oilily fashion boutique, or simply as a very proficient entrepreneur. Nowadays, he is probably best described as an author, inventor, and think-tank consultant; executives understandably keen to draw on his years of unique personal and professional experience to enhance their brands. However, anyone around in the early 80s would probably agree that his greatest personal gift to the island was his beloved telecommunication’s business. Despite this initial blip, word soon got round, and Rick’s business took off monumentally. For 10 years, all manner of nationalities and characters piled in. Open 8am to 8pm, 6 days a week, the office became a veritable hub of frenzied activity; a social club many would say. Anybody who was anybody would secure their life’s projects at Rick’s door; including Nina Hagen and Ursula Andress. Relied upon for his warm hospitality and multilingual advice, he became the gatekeeper of many a major project or celebrity crisis. He recalls one time when his overseeing eye came in particularly handy: around the time of Freddie Mercury’s famous rendition of ‘Barcelona’ at the KU club with Montserrat Caballé, Freddie was honoured by Barcelona with the key to the city. Along with this great honour, came the offer to fund his 41st birthday celebrations at Pikes hotel. The party itself became the stuff of Ibiza legend. But, what few know is the carefully guarded secret of the Barcelona’s planned birthday cake for Freddie.